SCHUYLER COUNTY—The 2011 Schuyler County $43 million budget with a tax levy increase of 1.9 percent (the total amount of dollars collected from taxpayers) was approved by the Schuyler County Legislature on Monday, Nov. 8. However, the county tax rate (the rate used to calculate what each property owner will pay) for 2011 is going down from 8.17 to 8.16. “It is basically remaining flat,” County Administrator Tim O’Hearn said. A public hearing regarding the proposed budget was held prior to the regular meeting of the legislature to hear feedback from county residents. Among the objections raised was a $50,000 cut in spending by eliminating support for daily commuter bus runs to Ithaca. 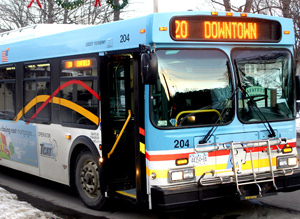 About 20 riders of the Tompkins Consolidated Area Transit (TCAT) commuter bus attended the meeting to express their concerns and urged the legislature to take another look at the budget and re-consider bus service to Ithaca. The riders brought up issues including; without a bus route some people may lose their jobs, more cars on the road will increase pollution, and parking is an issue in Ithaca. Legislator Dennis Fagan responded to comments by saying, “There are two sides to every coin.” He said at least half a dozen people have come up to him and said this is the right thing to do. Anticipation of a private takeover of the Schuyler County Home Health Care service will also provide the county with $500,000 in added revenue. The Schuyler County Legislature approved a resolution to officially revoke the tax exemption from sales and compensating use taxes for recipients from retail sales as well. According to O’Hearn it will provide a $220,000 increase in revenue for the county. Consideration was given or contracted to be given for certain clothing and footwear under the authority of the tax law of New York state. The resolution will take effect March 1, 2011. It is in accordance with applicable transitional provisions of the New York Law. Legislator Barbara Halpin was the only legislator to vote against the 2011 budget. She said she is against increasing the tax levy at all and believes there are other options to decrease spending. She also stated her concern that the Schuyler County Legislature did not take enough time to discuss other options and didn’t take enough time to look at numbers and benefits. • The legislature agreed to authorize a contract with Fisher Associates for construction inspection services of the South Genesee Street Bridge Project. Fisher Associates will provide this service in the amount of $124,000. Funding for this project is in the 2010-11 budget and it is fully reimbursed: 80 percent is federal, 15 percent is state and five percent is from the town of Montour. • The Schuyler County Legislature approved to accept and establish a Bioterrorism/Public Health Emergency Preparedness Grant. The Schuyler County Public Health Department has received a grant from the Health Research Institute (HRI) Bioterrorism/Public Health Emergency Preparedness (PHEP) in the amount of $60,750. The grant period extends Aug. 10, 2010 through Aug. 9, 2011. • The legislature approved to authorize a grant application for wireless E-911 services. The department of the state has offered counties money for the Local Enhanced Wireless 911 Grant Program and reimbursement for prior costs from April 1, 2010 to March 31, 2013. The grant is in the amount of $9,927. • The legislature approved contracts for an additional compensation program covering certified home health agency nurses. The certified home health agency is in the process of having request for proposals to sell the agency. According to the resolution the current staffing of the home health agency is exceedingly low. The director of community services and public health has suggested offering an incentive program to encourage nursing staff to stay in the certified home health agency until the responsibility for patient care changes to another provider. A contractual agreement with a one-time bonus payment to each home health nurse will be awarded. If responsibility for patient care changes to another provider before March 8, 2011 a bonus pay of $2,000 will be awarded. If responsibility for patient care changes to another provider after March 8, 2011, a bonus pay of $5,000 will be awarded. County Administrator Tim O’Hearn said there is an immediate need and this is most critical. • The legislature authorized an inter-municipal agreement with Chemung County for health, dental and vision insurance for county employees. According to the resolution significant premium savings will result, while also providing high quality benefits. The agreement will last from Jan. 1, 2010 through Dec. 31, 2010. • Discussion was placed on a resolution designating an official tourist promotion agency by the New York Tourist Promotion Act. The New York State Matching Grants Program is designed to encourage tourism promotion. The Watkins Glen Area Chamber of Commerce has been authorized to serve as the Schuyler County tourism representative to provide specific tourism services. The chamber of commerce has served as the county’s lead tourism promotion organization since its inception. It has requested to be designated at the county’s tourism agency for the 2011, 2012, and 2013 program year. Legislators agreed at their resolution review committee to change the resolution to only designate the Watkins Glen Area Chamber of Commerce as the official tourism agency for Schuyler County for a one year term.